Is there a couple out there who has more fun together than Ashlee and Jason? Mmmm, possibly, but I think not. We promised Ashlee from the very beginning of their engagement session that we’d get some good, standard, normal pictures of the two of them. Little did we know how difficult that would prove to be. I mean, who does that to two people having so much together, right?! Alright, I am exaggerating a bit. …I think it’s just not what they PREFER to be doing. They prefer being spontaneous and fun. Yes, most people prefer that, but Ashlee and Jason actually DO it! So I say, more power to them! (Here’s Jason enjoying the little tiny worm we found! There were also bunny rabbits and large lizards hanging out with us that day, but we didn’t hold any of those). Obviously, working with people this happy (and in love I might add) is AWESOME! We can’t think of a better way to spend our day than to hang out with fun loving people who bring us in on their fun as much as they can while we try to be “professional” and do our very serious work (yeah right). So thank you both for allowing us to spend a lovely afternoon with you at the Botanical Gardens in Tucson, capturing the joy you two experience when you’re together. I have a feeling that on your wedding day, you’re going to surpass your own records in how happy you can be… and we can’t wait to be there to see that happen! Click to see the rest of the photos from Ashlee and Jason’s Tucson Botanical Garden Engagement Session! When Josh and I (Kelley) got an email from Kim and Tru saying that they’d like to incorporate Camelback Mountain into their engagement shoot, we were stoked! Camelback is absolutely beautiful, and surprisingly enough, we don’t get to shoot there very often. I think it’s something about living in the desert makes people crave green fields and grassy parks in photo sessions. Understandably, when people plan a photo session, they often want something “different” than they see everyday. Ironically enough, that ends up making desert shoots in Phoenix pretty unique! All that to say Josh and I were extremely excited about a Camelback photo session. So, later on, when we heard why this location was so important to Kim and Tru, it was just the icing on the cake. You see, Kim and Tru hiked up Camelback on their very first date. Strangely enough, Kim didn’t know it was a date at the time. Nevertheless, Tru made sure it was the perfect first date. It fact, at one point during the climb, Kim slipped and Tru pretty much saved her life! A story that their families still talk about to this day! Now, some may think that this whole life saving story is an exaggeration, but I FULLY believe it. I was on that mountain with them during the photo session, and while some of us were falling over rocks, thinking a little too much about hidden rattlesnakes, and being attacked by tree branches (Josh and me… okay, mostly just me. ), or trying hard to gracefully climb a mountain in a dress and high heels (Kim), Tru was bouncing around from boulder to boulder fully enjoying himself and helping to keep us all upright. I think that he may secretly be part mountain goat, and I KNOW that he could save the life of a beautiful falling woman, like Kim. Not only was this mountain the venue of their first date, it was also the spot where Tru proposed. I can hardly climb Camelback Mountain on a normal day, I can’t even imagine somebody doing it with a stomach full of butterflies and an engagement ring hidden in their pocket. Still, being the mountain goat that he is, Tru made it all the way to the top that day, and proposed to Kim right then and there. It’s no wonder they wanted to use Camelback as the location for their engagement session. It’s obviously been a pretty huge part of their relationship, and now, with these engagement photos, it has yet another reason to hold a special place in their hearts. Kim and Tru, Josh and I absolutely loved hanging out with you two on the mountain and hearing more of your beautiful story! We can’t wait to watch (and photograph) the next chapter of that story as it starts next month on your wedding day! Click to see the rest of Kim and Tru’s Camelback Engagement Session. 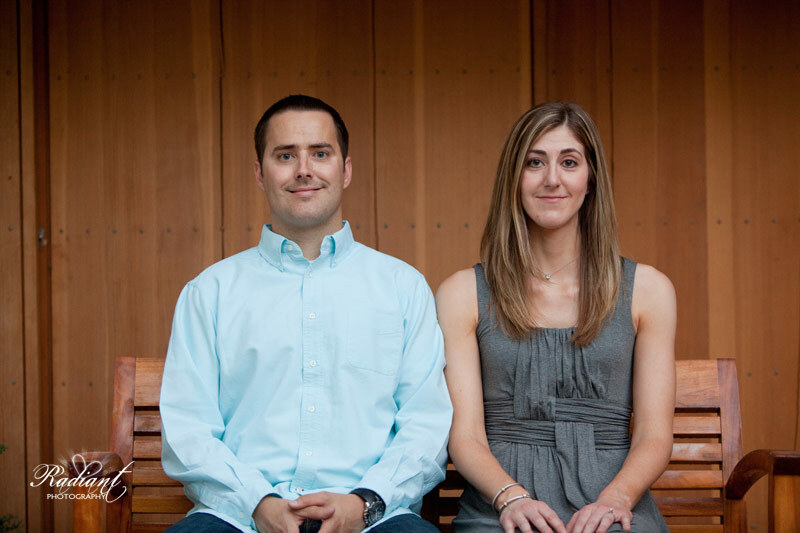 Are you ready to see more smiles in one blog post than you’ve likely EVER seen before? I hope so, because Niki and Steve’s engagement session is full of them! Even if you don’t know Niki and Steve (Josh and I consider ourselves lucky to have met them for sure! ), you can tell by looking at these photos that they are the kind of people who like to have fun and laugh at life. Seriously guys, these aren’t “canned” chuckles or forced, “Say CHEESE”, smiles. These are genuine, throw your head back, grab your belly, kind of laughs. And it’s not just one of them that has a great sense of humor, it’s BOTH! If Steve isn’t making Niki smile, it’s the other way around. They’re both jokesters in their own right. Not only can you see their fun and silly sides in these photos, you can also see, without a doubt, that these two are head over heels in love with each other. Now and then, while you’re having fun during an engagement session, you have to calm down and remember to get some lovey-dovey shots as well. However, Niki and Steve did both of these naturally and without any prompting. No kidding, one second they were kissing, and the next they were laughing hysterically. It was the perfect mixture of sweet and silly. Aside from the fact that my comment made me seem like a creepy, paparazzi stalker, it shows just how great Niki and Steve are to be around. Taking photos of people is our job, but when it’s with people like Niki and Steve it doesn’t feel like work at all. Niki and Steve, thank you both so much for letting us be your paparazzi for an evening. We had a blast and can’t wait for your wedding in May! 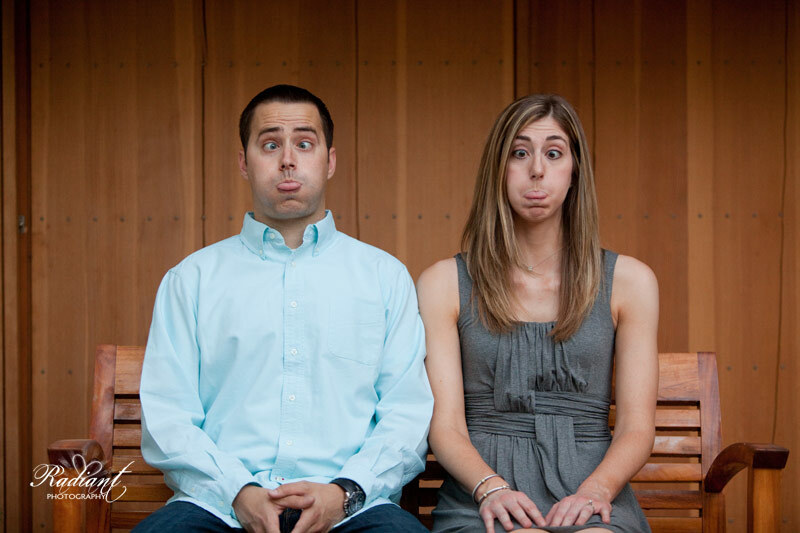 Click to see the rest of Niki and Steve’s Silly and Sweet Engagement Session.